It may also signal the failure — at least for the time being — of software GPS receivers to gain traction in mass market applications, the double-edged nature of lawsuits that can cut two ways, and the importance of cash reserves in an era when banks have sharply curtailed lending. On February 10, CSR and SiRF announced plans to merge the latter company into the former in a pure stock deal, rather than a cash-out acquisition. SiRF shareholders will receive 0.741 of an ordinary share in CSR for each SiRF share, which values SiRF at approximately $136 million (£91 million). That’s a premium of approximately 91 percent on the closing SiRF share price of $1.08 on 9 February 2009, and a premium of approximately 57 percent over the average closing SiRF share price over the prior three months. Following completion, SiRF shareholders will own approximately 27 percent of the enlarged CSR group. Formally, SiRF will merge with a newly organized U.S. subsidiary of CSR. Completion of the merger is subject to the approval of both SiRF and CSR shareholders, clearance by regulatory agencies, and certain other conditions. CSR anticipates a one-time integration expense of $15 million. GLONASS, Compass/ Beidou, and related technologies. He bills himself as the "oldest living GPS journalist." Gibbons lives and works in Eugene, Oregon, USA. SiRF’s interim CEO, Dado Banatao, is expected to join the CSR board as a non-executive member, and Kanwar Chadha, a SiRF founder and vice-president of marketing, as an executive director — that is, Chadha will become part of the post-merger CSR senior management. Both Banatao and Chadha have committed to vote their shares in SiRF — about 4.8 of the company’s issued share capital — in favor of the merger. Both companies bring strong brand equities and market share (though less now than in the past) to the table. CSR, with a focus on handset manufacturers, says it ranks first in every Bluetooth market segment with a unit market share in excess of 50 percent. The company also has a range of other “connectivity” technologies — FM, WiFi, ultrawideband (UWB), and near field communications (NFC) — in various stages of development that CSR groups in its Connectivity Centre. WiFi is furthest along, with CSR’s third-generation UniFi6000 now sampling with customers. It has demo chips for its NFC offering. UWB is an active project with a small team behind it, but is part of CSR’s PC group, not its handset business. The company has also introduced CSR Synergy, a wireless system software that enables customers to adopt a growing complement of wireless connectivity technologies. CSR estimates that the combined annual market for these technologies will grow from $3.5 billion in 2008 to between $5 and $7 billion by 2012. SiRF, probably the industry’s most ambitious promoter of consumer GPS since its founding in 1995, has its SiRFstarIII chip technology embedded in leading portable navigation devices (PNDs), cell phones, and other mobile devices sold by such companies as Research in Motion (Blackberry), Mio, MiTAC, Pharos, and Motorola. The CSR-SiRF merger will allow the companies to bring their new story to a high-profile industry event for a key market: the GSMA Mobile World Congress 2009 this week (February 16–19) in Barcelona, Spain. Indeed, on the first day of the congress, CSR unveiled its CSR9000, a which the company says will support 60-square-millimeter (or smaller) modules combining Bluetooth, Bluetooth low energy, Wi-Fi (IEEE 802.11a/b/g/n), FM receive and transmit, and GPS. The announced transaction came near a recent nadir in the prospects of both companies — at least as measured in market capitalization and share value. Just over two and half years ago, both SiRF and CSR were flying high. On May 11, 2006, CSR’s share value reached £15.22, then worth about US$28.65. Less than a month earlier, SiRF stock had peaked at $39.15 per share. By last November, however, CSR stock had dropped to £1.52 (US$2.26); on October 31, 2008, SiRF shares traded at $0.94. Last week’s announcement has been good for both companies: on February 13, SiRF closed at $2.04, nearly double its price a week earlier; CSR closed the same day at £2.10 (US$2.99), up from just under £1.80 the day of the merger announcement. The companies needed some good news. CSR reported revenue of $140 million for fourth quarter 2008 (down from $205.5 million in the third quarter) and $695 million for the full year. The company had an operating loss $8.5 million compared to a 2007 profit (before tax) of $150.1 million on revenue of $848.6 million. As for SiRF, in the fiscal year ended December 27, 2008, using general accepted accounting principles (GAAP), the company had revenues of $232 million (compared to $329 million the previous year). Net loss before provision for income taxes was $360 million (versus 2007 loss of $6 million). This loss included a goodwill impairment charge of $216 million and an acquisition-related asset impairment charge of $43 million. After adjusting for these and certain other items, SiRF had a non-GAAP net loss of $36 million (compared to a non-GAAP profit of $60 million in 2007). In the conference call, van Beurden underlined the positive, noting that the companies would have had pro forma combined revenues of $927 million and a pro forma $378 million in cash on hand at the end of fiscal year 2008. He said that CSR also expects at least $35 million in annual cost synergies will be achieved within 60 days of the merger closing. Approval of CSR and SiRF shareholders will be sought at a general meetings expected to take place in May or June 2009. The parallel reversal in fortunes arose from both internal and external developments. In their market-cap heyday, CSR and SiRF made a series of acquisitions designed to bolster their technology portfolios, particularly in the — respectively — GPS and Bluetooth expertise that they needed. In January 2006 SiRF bought Impulsesoft Pvt. 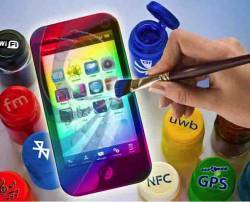 Ltd., a Bluetooth-embedded software company in Bangalore, for US$15 million in cash and stock. But the acquisition never led to products that caught fire in the marketplace. SiRF also bought TrueSpan in March 2006 to acquire the latter company’s mobile digital audio and video technology, which it planned to leverage into a mobile television chip. A little more than a year later, SiRF paid $283 million in a combination of cash and shares to buy Centrality Communications, a Redwood City, California, company to add multimedia and system-on-a-chip (SoC) capabilities. At the 2008 Mobile World Congress SiRF rolled out its SiRFprima multifunction platform, which exploited the Centrality technology by integrating a GPS/Galileo location engine with multimedia and 3D graphics capabilities and extensive peripheral support. However, at the last minute, the company canceled plans to launch SiRFTV, a mobile television chip that would have connected with SiRFprima. On the GPS front, SiRF lost its exclusive supplier relationship to leading PND manufacturer TomTom in late 2006 when the Dutch company announced plans to switch part of its product line to Global Locate. In the wake of TomTom’s move, SiRF soon filed a lawsuit in U.S. District Court charging patent infringement by Global Locate, Inc., which was acquired in a $143 million cash deal the following year by Broadcom Corporation. Global Locate (later Broadcom) subsequently filed a complaint in the U.S. International Trade Commission (ITC), alleging patent infringement and seeking a halt to SiRF’s importing chips, as well as imports of SiRF chips by customers. The ITC recently issued final a determination that applies the import ban to SiRF and four named customers: Pharos, Mio, MiTAC, E-TEN. Van Beurden told the stock analysts that “SiRF has work-arounds for most patents; so, SiRF’s business should continue without material disruption.” He declined to elaborate on what the work-around are. Meanwhile, the recent slowdown in consumer spending has put PNDs on the “bleeding edge of that trend,” says Chadha. Despite a similar slowing in growth of handset sales, the increasing rate of GPS penetration in mobile phones still makes it an expanding market for GPS suppliers such as SiRF. Although global handset shipments are expected to drop by 4–5 percent in 2009, according to a January report by ABI Research, GPS-enabled phones will climb to 240 million units, an increase of 6.4 percent over 2008. However, a strong push by Texas Instruments (TI) and other wireless semiconductor companies (e.g., Broadcom) into the mobile phone location marketplace began to erode SiRF’s market share in recent years, a situation worsened by turmoil at Motorola, an early SiRF customer for handset GPS. 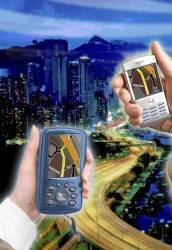 TI obtained a strong position providing GPS chips to leading handset manufacturer Nokia. In its efforts to come up with an in-house GPS capability, CSR sought to solve its GPS technology needs by acquiring Swedish start-up NordNav Technologies AB in January 2007, for $40 million. NordNav had developed a software GPS receiver as well as a GPS/Galileo simulator. Almost simultaneously CSR bought nearby Cambridge Positioning Systems Ltd. (CPS) for US$35 million. CPS had developed an assisted-GPS (AGPS) technology that could also provide a cellular network–based positioning solution — with both capabilities bundled as Extended GPS (eGPS). Although their previous GPS and Bluetooth acquisitions showed up in some product designs, neither company felt that they had developed a winning combination in-house. “Given enough time, we could have developed a good Bluetooth solution,” Chadha told Inside GNSS. But time was something that the companies didn’t have. Bluetooth technology was becoming increasingly commoditized with a corresponding decline in margins on Bluetooth-only products. Leading handset manufacturer Nokia had become increasingly open about its plans to incorporate GPS into more of its phones along with the connectivity technologies. Meanwhile, the wireless convergence trend continued to accelerate. TI and Broadcom launched combined GPS/Bluetooth/FM chips last year. On February 16, Skyhook Wireless announced at the Mobile World Congress that TI will use Skyhook’s hybrid GPS/WiFi positioning technology in its mobile chips target for handsets. By mid-2007 CSR was already looking for prospective partners that had a stronger GPS technology but lacked a solid Bluetooth offering, according to Stuart Strickland, former vice-president of CSR’s location based services strategic business unit. The first substantive contact with SiRF came in December of that year in discussions around a specific joint product development project. 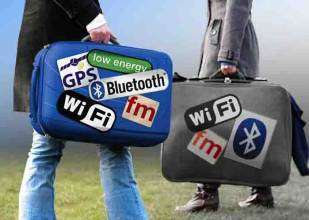 By early 2008, lack of headway in developing their separate GPS/Bluetooth combinations led the companies to expand the conversation to potentially joining their businesses together. In fact, Tim McCarthy, director of SiRF’s wireless marketing group, reportedly dubbed the collaboration, BOB — the best of both. Strickland says that SiRF was favored by one of CSR’s important customers, and another GPS acquisition/merger prospect was backed by another customer. Over the last four to five months, however, the conversation deepened and went in SiRF’s direction, leading to the February 10 announcement. Assuming the merger goes through, van Beurden said that the companies will be fully engaged in cross-selling their customers by next year and bringing out their first “combined product roadmap — silicon jointly developed” by 2011. The companies share many customers, he said, but offer them different products. With access to the SiRF IP, CSR would have more than 200 GPS-related patents. During the rest of 2009, van Beurden said the companies will take advantage of cost reductions previously announced in 2008 for SiRFand CSR of $35 million and $25 million, respectively, in addition to the $35 million in cost synergies expected with the merger. Chadha identified TI and Broadcom as its main direct competitors in the handset markets and, to a lesser extent, Atheros Communications (which acquired u-Nav in late 2007). He characterized Qualcomm as an indirect competitor because its convergent wireless approach focuses more on the modem rather than chip-level integration. Another prospective competitor is the recently completed 50/50 joint venture that united the wireless semiconductor division of STMicroelectronics and the mobile platform division of Ericsson, which will move forward as ST-Ericsson. Announced in August 2008, the agreement between the parent companies merged Ericsson Mobile Platforms and ST-NXP Wireless. The latter company had been formed earlier that year, shortly after NXP had acquired GPS technology supplier GloNav, Inc.
As an outside observer who had an insider perspective until he left CSR last December, Strickland believes that both companies will benefit from (and needed) the merger, but will bring new challenges to old ways of thinking. Although the NordNav technology may continue to play a role in CSR product development, the engineering team from that acquisition will probably be absorbed into other efforts, predicted Strickland, who had joined CSR with the NordNav acquisition where he had responsibility for strategic planning. Chadha’s comments seemed to suggest the same. SiRF has moved the navigation algorithm onto the host, but that requires relatively few interrupts of the CPU operation. “But if you try to move the whole signal processing onto the host, that’s very inefficient,” he added. As for the eGPS solution brought over from CPS, Chadha said that it will fit will under the company’s multimode platform umbrella. Social networking will make users “active participants with location,” providing user-generated content that can be distributed. In these developments, the “generational impact” will be substantial as younger users who have been raised on the Internet and mobile phones shape the applications of the future. Glen Gibbons is editor and publisher of Inside GNSS magazine, which covers the policies, programs, engineering, and most challenging applications of the Global Navigation Satellite Systems: GPS, Galileo,GLONASS, Compass/ Beidou, and related technologies. He bills himself as the "oldest living GNSS journalist." Gibbons lives and works in Eugene, Oregon, USA.